GAMBY has officially launched! The first 20 kits have been packaged and are available for sale on tindie.com! Jimmie Rodgers is also selling them in his touring soldering workshop. The GAMBY site is also live, featuring detailed assembly instructions, programming documentation, sample resources and tools. The libraries and sample code are all up on Github, too. GAMBY is Games for Arduino, Made By You — an acronym that I totally didn’t make up retroactively to fit the name. I can’t wait to see what people do with it! I received this lumpy (and unsettlingly squishy) package from China. 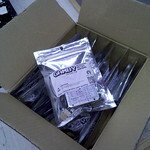 Inside were more than 500 fresh, clean GAMBY printed circuit boards! This is pretty exciting. Prototypes are one thing, but this is something else. GAMBY is now, undeniably, a real thing. I haven’t been updating the blog, but I have been working on things. 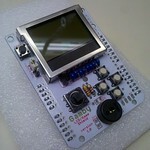 Among them is GAMBY, my LCD/game shield for Arduino. I just had a second batch of six prototype boards manufactured, this time by Laenof DorkbotPDX. Hopefully, this is close to the final design; there are a few minor changes to be made, but those shouldn’t impact the pinout, layout or components. I’ll assemble one today to verify that it works, and I’ll be modifying the existing code libraries to match the revisions made since the previous prototype. As the W&B soda machine has been unplugged for the winter, I am putting the soda machine hack project on hold for a couple of months. In the meantime, I’m returning to some past projects, several of which I never wrote up in the blog. 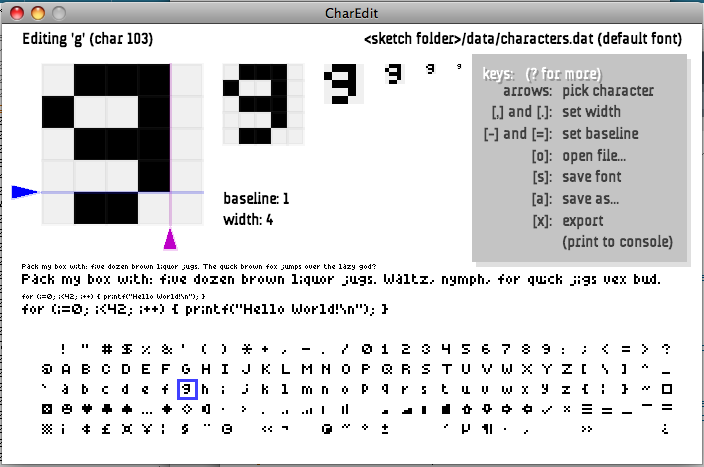 One such project is a system for handling and displaying an ultra-tiny bitmap font on a little graphic LCD, the sort that were on nearly every 90s cell phone and are currently popular with hobbyists.